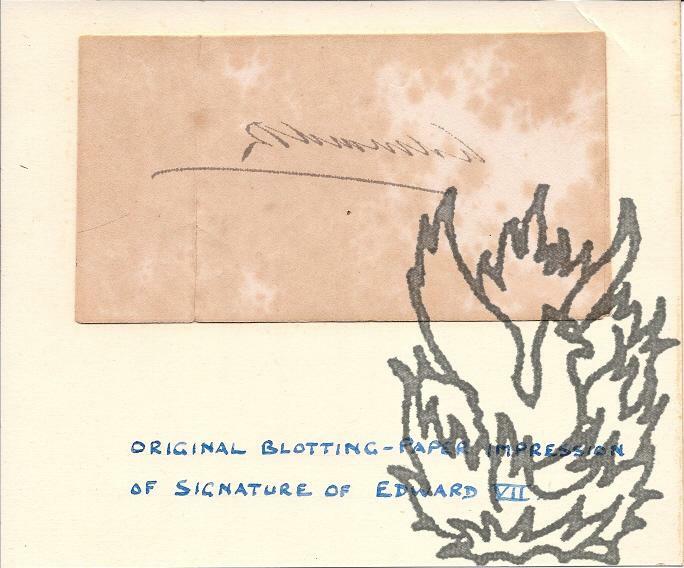 On piece of blotting-paper, 14 x 13 cm; folded horizontally to make two rectangular leaves, each 7 x 13 cm, with the signature presented in the centre of the first leaf, and with the back leaf laid down neatly on a piece of cream card, 14.5 x 17 cm, with caption at foot of card: 'ORIGINAL BLOTTING-PAPER IMPRESSION OF SIGNATURE OF EDWARD VII.' Being the result of blotting, the impression is a mirror image of the original, with the firm signature 6 cm long, with a 7.5 cm underlining. 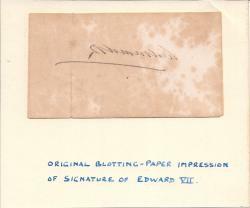 On mottled paper, with neat vertical fold on left-hand side, crossing the underlining of the signature one centimeter from the left.